The Ritz-Carlton Residences just released the first of their ads from our photo shoot this winter, and I am extremely happy to finally see the finished product. 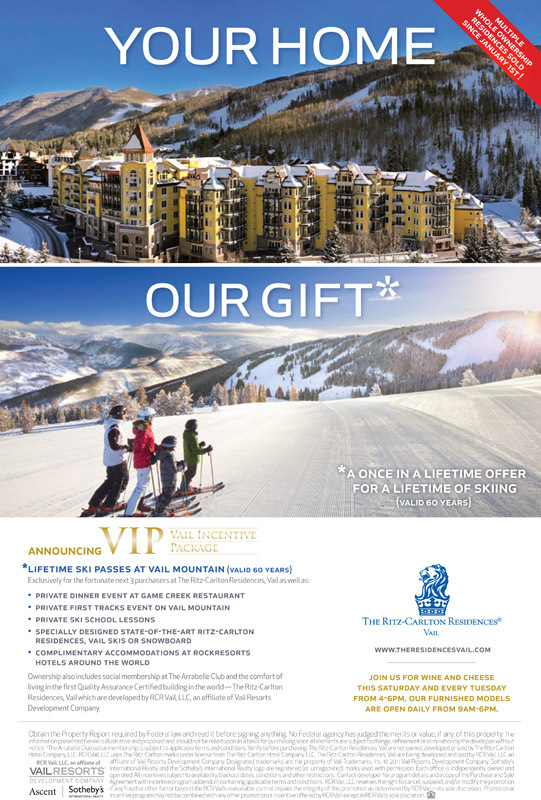 We photographed several interior scenes of the beautiful Vail residences and shot some skiing images on Vail Mountain for this ad promo, combining the two to capture the feel of a visit to Vail. For the skiing shots, we headed out early in the morning to catch first light on the mountain. I am standing on a ladder to get a higher perspective and my two assistants are using reflectors to cast light on the models. I always make sure to combat the harsh light of the winter with these reflectors and the cast light created a perfect fill on the models. It was a spectacular morning on Vail Mountain and a beautiful view of the area! Thanks to Emily Curtis and Kate Hudnut for art directing this shoot. The help that you two provided on this shoot worked to produce a great looking final product for Ritz-Carlton Residences! I look forward to sharing the other ads as they are released – keep an eye out! Here are the image details of the cover shot: I used the Canon EOS 5D Mark II with the TS-E 17mm f/4 L lens at an aperture of f/18, a shutter speed of 1/50, and an ISO of 200.